Husband and wife team, Larry Martin Sr. and Jenni Martin moved to Kentucky from Michigan in March, 1995. They drove away with five U-Haul trucks, some stacked to the ceiling with blueberry plants and others with personal belongings. They could not believe how happy the blueberry plants were in Kentucky’s climate – they were growing like weeds! They continued to expand their product. According to the Kentucky Department of Agriculture at the time of their move, Larry and Jenni had brought more blueberry bushes with them than were in the entire state of Kentucky to that date! Word soon spread and people wanted to see what these “Northeners” were doing, and often wanted to purchase a few plants on their visits. In 2002, Kentucky Blueberry Growers Association (KBGA) was launched with a simple survey, membership drive, a newsletter and a meeting. The KBGA has since grown into 200+ members within Kentucky and even some surrounding states. Each year since, the KBGA has hosted the family-friendly Kentucky Blueberry Festival in downtown Edmonton and is a favorite of Metcalfe County residents and beyond. You can now visit KBGA’s warehouse at 1101 W. Stockton St. in Edmonton, KY.
Larry and Jenni have retired and sold the business to a Christian family owned and operated business based in California. 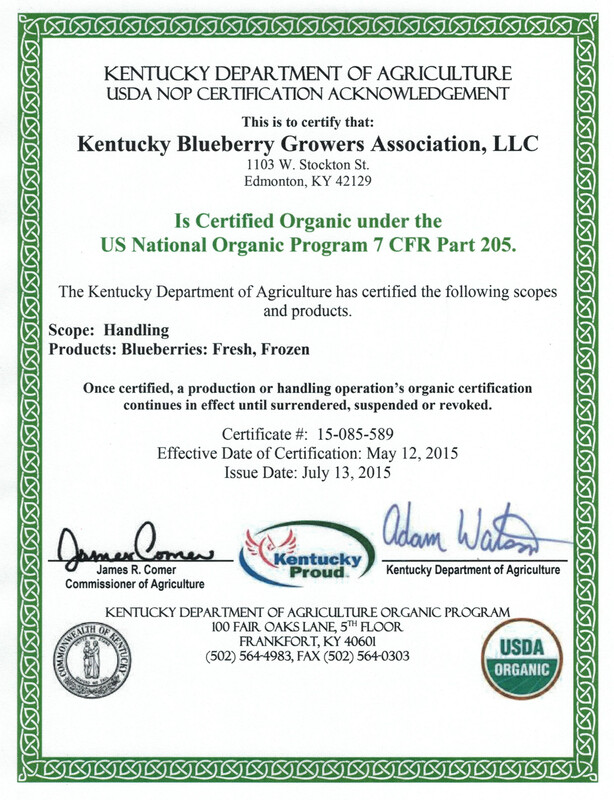 With farms across the nation, including a 10 acre Certified Organic bluberry farm in Burkesville, KY, the new owners are eager to steer KBGA in the Organic direction. 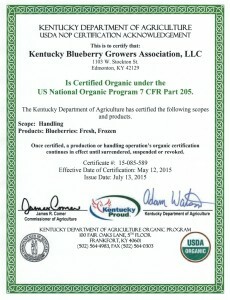 As of 2015, KBGA is a Certified Organic processing facility and market fruit to locally community member, KY public schools and to groceries in nearby cities.